School board candidates Ramon Joaquin and Eduardo Lanchipa falsely claimed to have attended “all” Board of Education meetings over the past six months in a voter guide distributed to the public on Monday night. 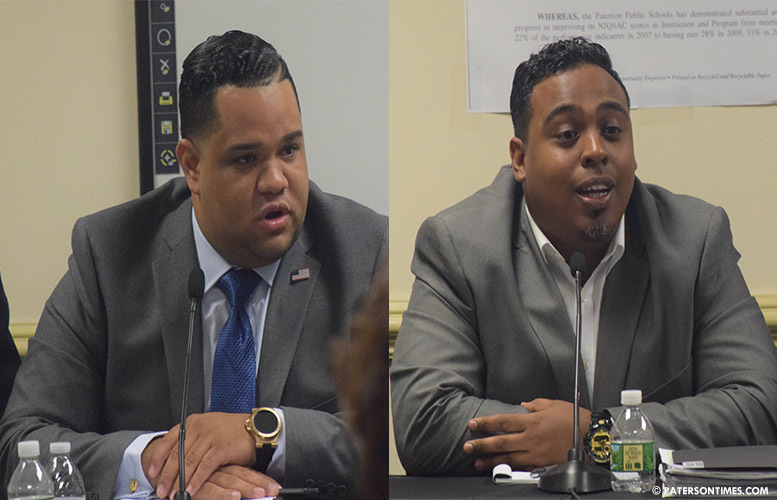 Both men appeared to defend their claim following a debate at the school district central office. “Maybe you didn’t recognize me because I had a different haircut,” said Lanchipa (right) on Monday night. School board meetings are sparsely attended. Six people, who regularly attend meetings, said they never saw Lanchipa at a meeting. “I’ve been in attendance. There’s been cases where I watch from home,” said Joaquin (left) on Tuesday morning. Physically being at a meeting and watching it on television counted as attendance, he argued. Both men are part of the same ticket in the 17-person race. Some of their opponents slammed them for attempting to deceive the public. Rucker attended the August meeting when Jessica Schutte was appointed to the school board. He saw neither Joaquin nor Lanchipa, he said. In the same survey, where Joaquin and Lanchipa claimed to have attended every meeting in the past six months, Rucker wrote that he attended one meeting. He said he follows live streams of the board meetings on social media. Teague suggested Lanchipa would know what the school-to-prison pipeline is had he attended meetings. “This is the guy that said the school-to-prison pipeline is something we should look into. He was talking like the school-to-prison pipeline is something the kids could use,” said Teague referring to Lanchipa’s comments at the first debate two weeks ago. 2 Scumbags! 2 future felons! I met Ramon Joaquin during the Mayoral election. Though we supported different candidates I can honestly say he cares for the city of paterson and the youth . He’s got my vote . And besides it’s not like you get much done at those meetings anyway he’s better off watching from home he can focus more .